Good morning – we are going through a spring thaw here in New England – it got up to the high 40’s yesterday and for the next week, it is supposed to bounce around from the 20’s to the high 50’s – I suppose based on how the jetstream fluctuates – a little to the west and the warm air from the south will get sucked up along the coast – a little to the east and that action will be out to sea and we will have the arctic down-draft instead. A few dozen miles probably will make a big difference – so we shall see what we actually get. There is about 3 or 4 inches of snow on the ground except for the banks of the pond which have southern exposure and have pretty much melted off due to solar gain. 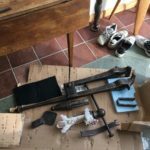 My eBay vise arrived in excellent condition – the seller very helpfully took it apart for shipping and did an excellent job packing/protecting it. 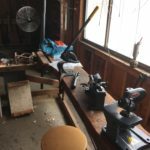 It is up in my Dad’s shop next to the wood stove till I have a place to mount it – we are actively trying to get my shop de-cluttered now that the first workbench is complete. Maybe today we will get the drill press assembled and off the floor. My Dad has gotten a lot of ideas around doing things with sheet metal and has purchased a number of new tools – the most recent one is a rotary shear (think REALLY powerful can opener style). Pictures below of some of the recent purchases. I am interested in trying them out ! The eBay purchased vise arrived in very nice condition. Footwear gives you a sense of scale. The main bit is probably about 45 pounds in weight. In the foreground, two new sheet metal shearing machines my Dad has just purchased. The shears with the arm mounted is something he already had. In the background is a new vise from Capri which looks VERY nice. I might get one too! Last night we watched a DVD that was a Christmas gift — “From Ore to Axe” which is a film by Ken Koons and is not only really interesting, but has really high production values considering about 5 guys and an iron ore sniffing dog made it. Basically, these smiths have been experimenting for about 10 years to recover the techniques for finding iron bearing rocks, building a furnace out of clay, creating charcoal and converting the ore into iron and then something useful. They are really good at it now and really show you the whole process. In the movie, they take you through the entire process from rocks found in the woods to making a Hudson’s Bay Axe style axe from Vancouver, British Columbia (the link here takes you to Best Made – I have one of their Hudson’s Bay axes and love it). There are a lot of videos on YouTube about the blacksmithing parts and it turns out there are also at least a fair amount on the smelting of the ore – but I have to say, Ken Koons and team make it really, really clear in terms of why they are doing things the way that the do and how to do it – that clearly comes from a LOT of practice. I started to dig around on YouTube this morning about smelting iron ore and found there is a group in England who are taking a scholarly approach and writing papers, books and what not – the Wealden Iron Research Group . It may not be true – but based on the results in the video below – you get the impression that the Lee Sauder/Ken Koons team have really been DOING IT while the team in the UK has figured out how to do it and done it a few times – but more to be able to write it up rather than actually get really good – both are adding to the current record of information in different ways! Iron was made in the Weald from pre-Roman times until the beginning of the 19th century. Its legacy is recalled by a host of place names, such as Minepit Wood and Forge Lane, by the hammer and furnace ponds which survive in the landscape, and by the cast-iron graveslabs and firebacks that can be seen, respectively, in Wealden churches and farmhouses. During the first part of the Roman occupation, and again, in the 16th and early-17th centuries, the Weald was the most important iron-producing region in the British Isles. Over 800 iron-making sites have been identified in the Weald, and more are discovered each year. Since 1968 when it was established, much of this work has been carried out by the Wealden Iron Research Group (WIRG). “The blast furnace and its spread from Namur to northern France, England and North America,1450-1640; a technological, political and genealogical investigation. This could be pretty interesting! Finally – the way I found the Weaden Iron Research Group themselves is via the YouTube channel of Harry Rogers – who looks super interesting too! He is a leather worker and windsor chair maker – with 46k subscribers to his YouTube channel and lot of very interesting videos on leather working, old farm implements and what not. Its amazing what you can find on YouTube!